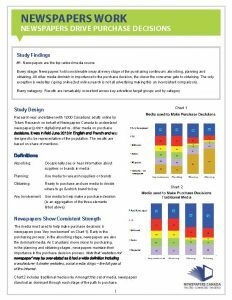 Research was undertaken with 1,000 Canadians adults online by Totum Research on behalf of Newspapers Canada to understand newspaper (print + digital) impact vs. other media on purchase decisions. It was in field June 2013 in English and French and was designed to be representative of the population. The results are based on share of mentions. 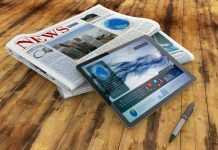 Newspapers are the top ranked media source. 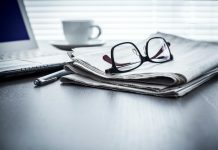 Newspapers hold considerable sway at every stage of the purchasing continuum: absorbing, planning and obtaining. All other media diminish in importance to the purchase decision, the closer the consumer gets to obtaining. The only exception is websites / going online (but online search is not all advertising making this an inconsistent comparison). Results are remarkably consistent across key advertiser target groups and by category.